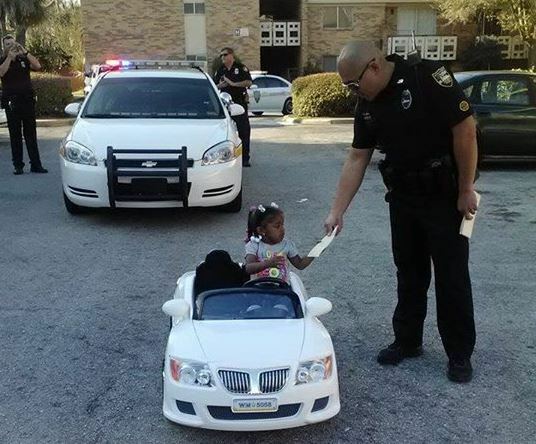 Toddler Za’Dariyah Mishaw was cruisin’ top down through the parking lot of her Florida apartment complex when, all of a sudden, she was stopped and hit with a $4 traffic ticket from a police officer. Adorableness ensued. Her uncle Keyth took the photo, and sent it to local news station First Coast News. Naturally, something this cute doesn’t go unnoticed. The picture has since gone viral on their Facebook page. The family appeared on a news segment, and Keyth explained that Za’Dariyah’s run in with the cops was all in good fun, but she was bumping into some cars so, she deserved to be cited. “She’s gotta pay her ticket,” mom Zumekia joked.